Bruce Fife, C.N., N.D – the Author of over 20 books including the best selling "THE COCONUT OIL MIRACLE", "COCONUT CURES" and "STOP ALZHEIMER'S NOW". Publisher and editor of the Healthy Ways Newsletter and Director of the Coconut Research Center,Certi&ed nutritionist will be the keynote speaker of the upcoming “The Medical Science of Coconut Oil Forum” along with other nationally recognized speakers. The Forum which will be hosted at the Ateneo Professional Schools Auditorium on Monday, May 22, 2017. This event is the first forum on the Medical Science of Coconut Oil, attracting 200 attendees who come together for the opportunity to gather information from various Medical Health and Wellness individuals. With this, Dr. Bruce Fife will be having a book signing at the International Food Exhibition at the World Trade Center Tent on May 21, 2017 at booth numbers 32 and 33. 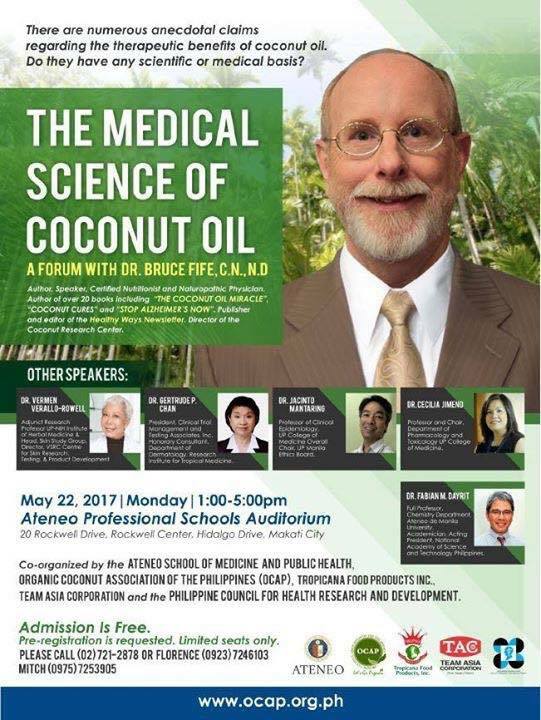 Dr Bruce Fife and other speakers will share their first hand medical experiences and expertise on Coconut Oil. This forum will further elaborate scientifically the Medical and Nutritional uses of Coconut Oil on mankind. Increased utilization will contribute in the improvement of the lives of coconut farmers thru increased income from value-added products. Dr Bruce Fife will be joined by the following panelists: Dr. Vermen Verallo-Rowell - Adjunct Research Professor at UP-NIh Institute of Herbal Medicine and Head, Skin Study Group, Dr. Gertrude P. Chan - President, Clinical Trial management and Testing Associates, inc, and Honorary Consultant at Department of Dermatology, Research institute for Tropical Medicine, Dr. Jacinto Mantaring - Professor of Clinical Epidemiology at UP College of Medicine Overall chair, Up Ethics Board, Dr. Cecilia Jimeno - Professor and Chair of Pharmacology and Toxicology UP College of Medicine, Dr Fabian M. Dayrit - Full Professor, Chemistry Department at Ateneo De Manila University,Acting president at National Academy of Science and Technology Philippines. This is forum is co-organized by the Ateneo school of Medicine and Public Health, Organic Coconut Association of the Philippines (OCAP), Tropicana Food Products Inc., Team Asia Corporation and the Philippine Council for Health and Research Development.